What event could change your life? Winning the lottery? Getting a promotion? Getting a degree? Scoring a home run, or a winning goal? It might be hard to believe, but a breakfast conversation could be the most consequential event in your life – if it is with Jesus. Looking at the breakfast conversation in John 21, we see how Peter’s life changed forever as he was challenged to step up and play his part in God’s big plan. And Jesus has an exciting challenge for all of us today. As Jesus captures our hearts with his love and forgiveness, we’ll be motivated to be part of something truly extraordinary. Perfect to read with men who you’d like to encourage to live all out for Christ or to give away at men's breakfasts. Dan is a great communicator who knows how to apply the gospel powerfully and insightfully to ordinary people's lives. His ministry with college students gives him a unique window into what is happening in the culture at large, and the gospel speaks to questions both new and old. 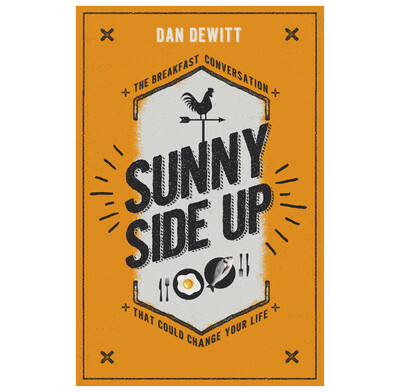 "Sunny Side Up" is Dan at his best! Every Christian understands weakness and failure. Dan's latest book is a powerful reminder that Jesus stands ready to forgive us when we fall. Pick up this book, you'll find encouragement to love Jesus more in these pages. This is more substantial and of longer-lasting value than any power breakfast I know. I found Dan's book current, relevant, and life-changing.